Tom Angleberger's latest, loopiest middle-grade novel begins when M'Lady Luggertuck loosens her corset (it's never been loosened before! ), thereby setting off a chain of events in which all the strict rules of Smugwick Manor are abandoned. When, as a result of "the Loosening," the precious family heirloom, the Luggertuck Lump (quite literally a lump), goes missing, the Luggertucks look for someone to blame. Is it Horton Halfpott, the good-natured but lowly kitchen boy who can't tell a lie? Or one of the many colorful cast members in this silly romp of a mystery. To ask other readers questions about Horton Halfpott; or, The Fiendish Mystery of Smugwick Manor; or, The Loosening of M’Lady Luggertuck’s Corset, please sign up. Horton was a poor , miserable servant in the neat and strict Smugwick Manor. When the grouchy Lady of the Manor (M’Lady Luggertuck) loosens up her corset , everything goes crazy! Apparently her corset is what made M’Lady so grouchy and strict. After she loosened her corset, all the rules of the Manor are broken but what is even worse, the Luggertuck Lump (a priceless family heirloom) is stolen! The Luggertuck family goes even crazier trying to find who took it. Horton realizes that the detective Horton was a poor , miserable servant in the neat and strict Smugwick Manor. When the grouchy Lady of the Manor (M’Lady Luggertuck) loosens up her corset , everything goes crazy! Apparently her corset is what made M’Lady so grouchy and strict. After she loosened her corset, all the rules of the Manor are broken but what is even worse, the Luggertuck Lump (a priceless family heirloom) is stolen! The Luggertuck family goes even crazier trying to find who took it. Horton realizes that the detective that comes to investigate just wants to eat and pretty much can’t do his job. Horton finds himself getting blamed for the theft. Horton and his friends, the snooping stable boys (Bump, Blemish, and Blight), decide that they have to catch the real thief! This book was hilarious! The characters in the books were really great. The names are even funny, like Loafburton (the baker). There were also The Shipless Pirates, a cranky cook and kooky relatives in the Manor (among others)! The book is set in Victorian times and I think it helped the story be even more funny. There are some illustrations in the book that show what the characters look like, but the story is the best part of the book. I think the book it’s good for any age because there is no violence or bad words and Mr. Angleberger just writes really well for kids (Mr. Angleberger also writes the Origami Yoda series). Although I loved just reading about all the funny characters, I think the mystery part of the book really made the story and I HIGHLY recommend it to everyone! 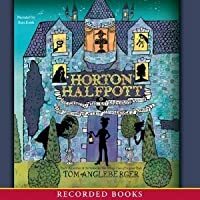 Horton Halfpott is a playful poke at English Victorian aristocracy, written by Tom Angleberger with clever satire from an intimate, judgmental narrator. When we meet Horton, he is a lowly kitchen boy tirelessly scrubbing dishes day in and out for a penny per week. His employers, Lady Luggertuck and her horrid son, Luther, live a ridiculously high life while the servants are kept on gruel and bread crusts (one crust per day, mind you). Horton meets and falls in love with wealthy Miss Celia Sylvan Horton Halfpott is a playful poke at English Victorian aristocracy, written by Tom Angleberger with clever satire from an intimate, judgmental narrator. When we meet Horton, he is a lowly kitchen boy tirelessly scrubbing dishes day in and out for a penny per week. His employers, Lady Luggertuck and her horrid son, Luther, live a ridiculously high life while the servants are kept on gruel and bread crusts (one crust per day, mind you). Horton meets and falls in love with wealthy Miss Celia Sylvan-Smythe, who is clearly above his station and seems to return the affection. When a series of thefts occurs in Smugwick Manor, a hunt for the thief ensues. The story wraps up with a romantic and entirely satisfying ending. 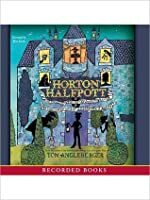 Humorous tween readers who are looking for something a little outside the typical realistic or historical fiction stories will appreciate Horton Halfpott. It’s a silly romp that includes a mystery, a tame romance, slapstick humor and crazy mistaken identities. The zaniness is anchored in “real” issues of class and society. Horton Halfpott is Upstairs Downstairs on a birthday-party sugar high. A positively delightful historical mystery farce. The trouble begins when M'Lady Luggertuck instructs her lady's maid, Crotty, to loosen her corset a bit. Everything starts to loosen all around and things start disappearing including the famous "lump" that has been in the family for ages. Horton, the hero, will have to figure it all out. Written in a clever manner in a style with a bit of Dickens and a bit of Snickett. I loved this book and think kids would love it. I don’t often use this phrase as a descriptor but I can’t think of a single more appropriate word for it, sooo at the risk of sounding like an owl, this book was a real hoot! 🦉 The wordy title alone ought to tip you off about what sort of book this is: Horton Halfpott and the Fiendish Mystery of Smugwick Manor OR The Loosening of M’Lady Luggertuck’s Corset. This middle-grade novella clocking in at just over 200 pages is A Series of Unfortunate Events meets Harry Potter liberally peppered with Dickensian characters and his brand of sharp humor. Except in this case our hapless protagonist isn’t a penniless orphan. Nor is he actually a wizard, or targeted by a failed actor hell-bent on stealing his fortune. It reminded me a lot of the book about Ivy Pocket that I read last year. But this one was better and Horton wasn't such an irritating and stupid character as Ivy was. I liked Bump, Blight and Blemish more then Horton, though. That was very cute. Full review to come. Tom Angleberger seems to have entered into that select group of authors elevated in common thought as being particularly good at writing for boy readers. At their best, his books are so much more than just that, but never does he fail to produce writing that is remarkably suited to the young male mind, displaying the mixture of humor and quick-moving plot that made Lincoln Peirce's Big Nate series and Jeff Kinney's Diary of a Wimpy Kid so popular. Though not quite the artist that either of those two authors is, Tom Angleberger uses his sketchy drawing style to add atmosphere to stories that sway from zany to mildly serious and back again, all while never stepping out of the underlying style of quirky humor that puts many typical boy readers at ease. Tom Angleberger's books aren't your average novels, but they're not just collections of goofy humor, either. He knows how to write a story that has genuine value for dedicated readers, and Horton Halfpott is a pretty good example of how he manages to do this, in a setting far different from that of The Strange Case of Origami Yoda. The Luggertuck manor isn't always a nice place to be for its scores of servants and other underpaid employees. Most of what makes it not nice is the presence of M'Lady Luggertuck, mistress of the household, whose strict rules haven't seen a loosening in the entire time that the current employees can remember. But on the day that M'Lady decides to loosen her corset, all of the strict rules of the manor naturally follow course, and the place is no longer such an unpleasant one in which to live. For kitchen boy Horton Halfpott, not much has changed, however. Honest nearly to a fault, Horton can't bring himself to take advantage of the long overdue loosening, even when he becomes smitten with a special female guest of the Luggertuck family who arrives to stay with them leading up to a grand ball to be hosted in the next several weeks. What Horton doesn't know is that M'Lady Luggertuck's scheming son, Luther, also has his eye on the young lady visitor, and is determined to make her go with him to the ball. Horton knows that he, himself, hasn't a chance with her; after all, he's still only a kitchen boy, and no girl from a family of high standing would want to attend a gala event with him when she could have her pick of the richest young nobles in the land. Yet Horton knows that Luther is certainly no prize, and fears what the warped heir-to-be might concoct to force the girl to go with him if she won't do so of her own volition. When valuable belongings begin disappearing around the Luggertuck manor, Horton is fairly sure he knows who is responsible for the sudden wave of larceny. It's only a matter of time before Luther brings together whatever foul plan he's building, and when that happens, who knows what fate will befall Horton and the other servants? Maybe Horton has it in him to rise above his inhibitions and finally challenge Luther, to permanently stop him from taking what belongs to others and making their lives miserable. As the story progresses it becomes increasingly clear that everything will go down on the night of the grand ball, and Horton will have to be smart and prepared if he's to outwit Luther and save his own friends and family. I picked up a ARC of this book and got it signed while at ALAN this year. I really wanted to get something signed by the writer since I really enjoyed his book The Strange Case of Origami Yoda. Been reading Horton Halfpott by Tom Angleberger as my before bed read every since ALAN; which meant it took me way longer than usual to finish the books because I hardly ever go to bed on time and spend most of my nights writing. But every time I picked up this book and read a chapter I really loved what I picked up a ARC of this book and got it signed while at ALAN this year. I really wanted to get something signed by the writer since I really enjoyed his book The Strange Case of Origami Yoda. Been reading Horton Halfpott by Tom Angleberger as my before bed read every since ALAN; which meant it took me way longer than usual to finish the books because I hardly ever go to bed on time and spend most of my nights writing. But every time I picked up this book and read a chapter I really loved what I read. I have heard comparisons for this book to Lemony Snicket's A Series of Unfortunate Events and though I see that in some fashion I never think comparisons are fair and look at each book as what it is, it's own story. But if you want to compare it to the Lemony Snicket books to find readers for this book then go for it. I think anyone who enjoyed those books will enjoy Horton Halfpott. This book has a great cast of characters given all the attention they need and no more, giving each scene all the attention it needs and no more, and gives the whole race of the story all the attention it needs and no more. Those things and more are way I really loved this story. The writer had a story to tell, he told it, and at no point in this tale did he waste the readers time on yelling "Hey, I'm a writer." but he is that. And also a very good writer. Very creative and tapping into a scene in a different way that I'm not reading in any other writing at the moment and that's what every writer in my view should strive for. This is a perfect book for relunctant boy readers. It is funy, silly, and strange. There are shipless pirates bumbling detectives, disguises, and a stolen diamond known as The Lump. It would be a great starting novel for those who enjoy graphic novels because it is a descriptive but fast paced. It sets up a household that is filled disgruntled workers and a spoiled noble family that is oblivious to anything other than their own needs. Horton is the kitchen boy with a good heart but bad things ke This is a perfect book for relunctant boy readers. It is funy, silly, and strange. There are shipless pirates bumbling detectives, disguises, and a stolen diamond known as The Lump. It would be a great starting novel for those who enjoy graphic novels because it is a descriptive but fast paced. It sets up a household that is filled disgruntled workers and a spoiled noble family that is oblivious to anything other than their own needs. Horton is the kitchen boy with a good heart but bad things keep happening to him. He works for the Luggertuck's in Smugwick Manor. His only friends are the stable boys Blight, Bump, and Blemish but he might be falling in love with the visiting Lady Celia but don't worry! This is not a kissing book. Wackiness ensues throughout the book! As I said earlier, this book will delight boys with it's irreverant humor and looniness. A lot of fun is packed into this book! Plus the cover glows in the dark. I must confess I was prepared not to like this book after reading the first page. I am not very enamored with the trend started with lemony Snicket of snarky narrators who dumb everything down for the reader by explaining everything. This book seemed to follow that trend. But while the narrator does at time explain things, the writing is smart and funny and lends itself to the reader being able to do some thinking for themselves. I love the character names! And, who doesn't love a story with a ha I must confess I was prepared not to like this book after reading the first page. I am not very enamored with the trend started with lemony Snicket of snarky narrators who dumb everything down for the reader by explaining everything. This book seemed to follow that trend. Quite the off-kilter mystery story, all stemming from the loosening of a corset. Yes, really. With quirky names like Luggertuck, Smugwick, Halfpott, the Shipless pirates, the lump, Bump, Blight and Blemish and I could go on and on. Trades of Dickens, gothic, farce and total silliness make for a delightful read. I am a big fan of Angleberger's The Strange Case of Origami Yoda, so I bought this book without caring what it was about... It is not like Origami Yoda-- more like Lemony Snicket, Lois Lowry's Birthday Ball, or The Incorrigible Children of Ashton Place-- pure farce and fun in a Victorian setting. There was just too much going on in this book, but none of it substantial enough to keep me going. There were some interesting characters and concepts, but everything felt cluttered, over exaggerated, and it felt like it was trying too hard. There was a whole lot going on in this book. I really couldn't get into it. I was really disappointed because, I really like his Origami Star Wars series. Just wasn't my cup of tea. Very funny book with an excellent, intrusive narrator. Seriously-this book was awesome. I loved Origami Yoda, but this book really shows the talent Angleberger's pen contains. Well done. Cute children's mystery with lots of very fun characters! I think that this book was just a little over my head on the imaginative side. When it didn't use too much imagination it was really good. Hilarious! You know your in for a treat when you have two subtitles for the cover. I snickered a lot while reading the tongue in cheek names and situations. Horton is a hero worthy of any book especially in a world were there as been a loosening of M'Lady's corset. We read it for book club and the kids are begging for all the side stories mentioned in the book. They were upset to be told that there isn't another book with all the stories mentioned. That was kind of fun to witness. (Maybe I have a Hilarious! You know your in for a treat when you have two subtitles for the cover. I snickered a lot while reading the tongue in cheek names and situations. Horton is a hero worthy of any book especially in a world were there as been a loosening of M'Lady's corset. I'm pretty sure I bought this book because of the cover. The cover is cool, and it glows in the dark, which is just a bonus. This book could lovingly be called a study in the absurd. The fact that it is so crazy makes it enjoyable. There is no way to guess what is going to happen next, because nothing follows any sort of logic. This book is an enjoyable read that I would recommend to anyone, even adults, because we all need a little absurdity every now and then. (3.5) This is a pretty good story line, and Tom Angleburger (is that how you spell it?) made the ship and the characters really adorable...but eh. He breaks the fourth wall in this book a lot, which I like, but he did a bit too much for my liking. He also made some emotions way to obvious for the reader. Also the whole backstory with Bump flys right over the plot, and is just tossed in there... but otherwise pretty good. 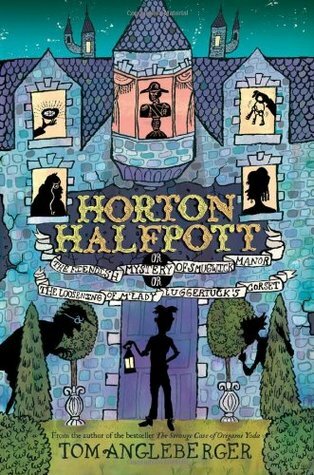 A silly mystery that tickles the funny bone, Horton Halfpott is a middle school mystery that many kids will like. Horton is a lowly kitchen servant in Smugwick Manor and the people he works for are horrible. He gets swept up in a mystery and has quite the adventure. There are lots of fun phrases and humor. I can see kids enjoying this story. Delightful! Fans of Dickens will love this wacky send-up of Victorian novels. Kids who don't care about Victorian novels (yet!) will enjoy the silliness and good-hearted heroes solving the mystery of the Lump even as they enjoy the Loosening. My son's pick for an audio book to listen to on a recent road trip. I enjoyed it much more than I thought I would. I loved how the author committed whole heartedly to the Victorian style. SO many, "Dear Reader"s that I kept giggling. Was a great family listen. Cute story and a fast read.